This collection features over 15 hours of bonus features, plus includes 15 films, 10 bonus TV episodes (on 2 new bonus discs) and a 58-page booklet. Universally recognized as the Master of Suspense, the legendary Alfred Hitchcock directed some of cinema’s most thrilling and unforgettable classics. 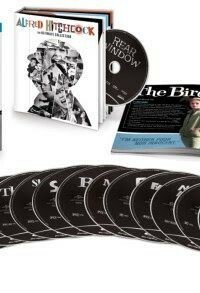 Alfred Hitchcock: The Ultimate Collection features 15 iconic films from the acclaimed director’s illustrious career including Psycho, The Birds, Rear Window, Vertigo and North by Northwest plus 10 episodes from his groundbreaking TV series, Alfred Hitchcock Presents and The Alfred Hitchcock Hour. Starring Hollywood favorites such as James Stewart, Cary Grant, Grace Kelly, Paul Newman, Janet Leigh, Anthony Perkins, Tippi Hedren, Sean Connery and Kim Novak, this definitive collection showcases a true cinematic master at his best.